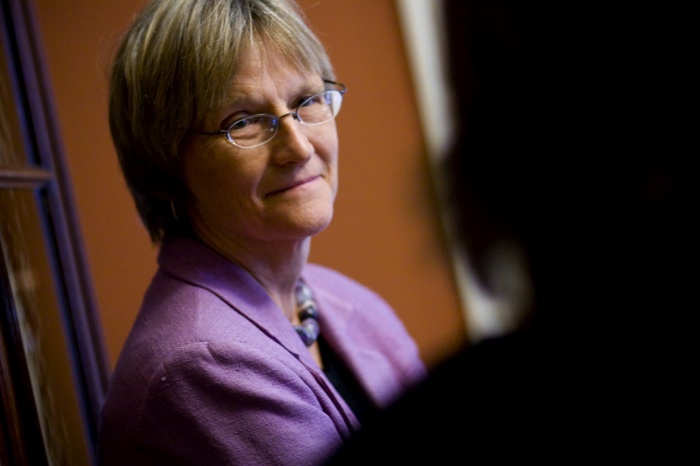 “We are on it,” President Drew Faust said of the University’s financial situation during a July conversation in her office at Massachusetts Hall. And she said, with equal emphasis, “Harvard is still Harvard.” Those twin messages neatly framed her first two years in office. Faust said such necessary steps, although impelled by financial pressure, were consistent with her aim from the outset of her presidency to “get Harvard to work better”: harnessing its strengths to enhance teaching, learning, and research. In that vein, she cited examples of intellectual momentum: the College’s new general-education curriculum, finally launching this academic year; the revitalized global-health initiative, bringing together faculty members from the public-health and medical schools, of course, but also many other professors—and extending to freshmen seminars, undergraduate courses, and student research opportunities and foreign experiences; and a course last spring on consumer finance, jointly taught by Reid professor of law Howell Jackson and Coleman professor of financial management Peter Tufano. (Despite the obstacles of separate campuses and unaligned calendars, Jackson reported, 60 upper-level students got a multidisciplinary perspective on pressing regulatory and business issues.) The goal, Faust said, is to enable such interactions without the interfering “tariffs and tolls” that have hampered interfaculty collaborations. Challenges remain, of course. For instance, FAS—about 60 percent reliant on the endowment for funding and already operating at a deficit—has much work yet to do to adjust to a leaner era, especially after recent large growth in its “faculty and footprint.” A faculty-retirement incentive and other measures may be in the offing. But in the present circumstances, Faust recalled telling her deans last winter, “Yes, here we are in a world we never anticipated. But what we do matters” to the institution’s future. It will be the collective responsibility of Harvard’s leaders, she said, to see to the “harnessing of our extraordinary resources…in a more integrated way,” to address teaching and find solutions to daunting social problems, from global health to the vexing intersection of energy and the environment.